This article is about the royal family. For the territorial states over which it ruled, see Timurid Empire and Mughal Empire. The Timurid dynasty (Persian: تیموریان‎), self-designated as Gurkani (Persian: گورکانیان‎, Gūrkāniyān), was a Sunni Muslim dynasty or clan of Turco-Mongol origin descended from the warlord Timur (also known as Tamerlane). The word "Gurkani" derived from "gurkan", a Persianized form of the Mongolian word "kuragan" meaning "son-in-law", as the Timurids were in-laws of the line of Genghis Khan,[full citation needed] founder of the Mongol Empire. Members of the Timurid dynasty were strongly influenced by the Persian culture and established two significant empires in history, the Timurid Empire (1370–1507) based in Persia and Central Asia and the Mughal Empire (1526–1857) based in the Indian subcontinent. The origin of the Timurid dynasty goes back to the Mongol tribe known as Barlas, who were remnants of the original Mongol army of Genghis Khan, founder of the Mongol Empire. After the Mongol conquest of Central Asia, the Barlas settled in what is today southern Kazakhstan, from Shymkent to Taraz and Almaty, which then came to be known for a time as Moghulistan – "Land of Mongols" in Persian [reference needed] – and intermingled to a considerable degree with the local Turkic and Turkic-speaking population, so that at the time of Timur's reign the Barlas had become thoroughly Turkicized in terms of language and habits. Additionally, by adopting Islam, the Central Asian Turks and Mongols adopted the Persian literary and high culture which had dominated Central Asia since the early days of Islamic influence. Persian literature was instrumental in the assimilation of the Timurid elite to the Perso-Islamic courtly culture. 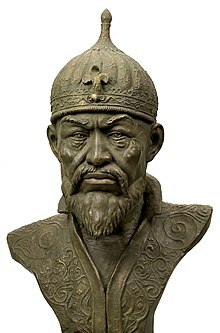 Timur ruled over the Chagatai Khanate with Soyurghatmïsh Khan as nominal Khan followed by Sultan Mahmud Khan. He himself adopted the Muslim Arabic title of Amir. In essence the Khanate was finished and the Timurid Empire was firmly established. Abu Sa'id's sons divided Transoxiana upon his death, into Samarkand, Bukhara, Hissar, Balkh, Kabul and Farghana. Timurid Empire in Central Asia becomes extinct under the Khanate of Bukhara of the Uzbeks. However, Timurid dynasty moves on to conquer India under the leadership of Zahir-ud-din Muhammad Babur in 1526 C.E. and established the Timurid dynasty of India. Babur 23 February 1483 1526–1530 26 December 1530 Was a direct descendant of Genghis Khan through his mother and was descendant of Timur through his father. Founded the Mughal Empire after his victories at the First Battle of Panipat and the Battle of Khanwa. Humayun 6 March 1508 1530–1540 Jan 1556 Reign interrupted by Sur Empire. Youth and inexperience at ascension led to his being regarded as a less effective ruler than usurper, Sher Shah Suri. Sher Shah Suri 1472 1540–1545 May 1545 Deposed Humayun and led the Sur Empire. Islam Shah Suri c. 1500 1545–1554 1554 Second and last ruler of the Sur Empire, claims of sons Sikandar and Adil Shah were eliminated by Humayun's restoration. Akbar 15 October 1542 1556–1605 27 October 1605 He and Bairam Khan defeated Hemu during the Second Battle of Panipat and later won famous victories during the Siege of Chittorgarh and the Siege of Ranthambore; He greatly expanded the Empire and is regarded as the most illustrious ruler of the Mughal Empire as he set up the empire's various institutions; he married Mariam-uz-Zamani, a Rajput princess. One of his most famous construction marvels was the Lahore Fort and Agra Fort. Jahangir October 1569 1605–1627 1627 Jahangir set the precedent for sons rebelling against their emperor fathers. Opened first relations with the British East India Company. He conquered the Himalayan range from Kashmir to Nepal. Jahandar Shah 1664 1712–1713 February 1713 The son of Bahadur Shah I, he was an unpopular incompetent titular figurehead; he attained the throne after his father's death by his victory in battle over his brother, who was killed. Shah Alam II 1728 1759–1806 1806 He was proclaimed as Mughal Emperor by the Marathas. Later, he was again recognised as the Mughal Emperor by Ahmad Shah Durrani after the Third Battle of Panipat in 1761. 1764 saw the defeat of the combined forces of Mughal Emperor, Nawab of Oudh and Nawab of Bengal and Bihar at the hand of East India Company at the Battle of Buxar. Following this defeat, Shah Alam II left Delhi for Allahabad, ending hostilities with the Treaty of Allahabad (1765). Shah Alam II was reinstated to the throne of Delhi in 1772 by Mahadaji Shinde under the protection of the Marathas. He was a de jure emperor. During his reign in 1793 British East India company abolished Nizamat (Mughal suzerainty) and took control of the former Mughal province of Bengal marking the beginning of British reign in parts of Eastern India officially. Akbar Shah II 1760 1806–1837 1837 He became a British pensioner after the defeat of the Marathas in the third Anglo-Maratha war who were until then the protector of the Mughal throne. Under the East India company's protection, his imperial name was removed from official coinage after a brief dispute with the British East India Company. Bahadur Shah II 1775 1837–1857 1862 The last Mughal emperor was deposed in 1858 by the British East India company and exiled to Burma following the War of 1857 after the fall of Delhi to the company troops. His death marks the end of the Mughal dynasty but not of the family. ^ Klingelhofer, William G. (1988). "The Jahangiri Mahal of the Agra Fort: Expression and Experience in Early Mughal Architecture". Muqarnas. 5: 153–169. doi:10.2307/1523115. ISSN 0732-2992. JSTOR 1523115. ^ S. N. Sen (2006). History Modern India. New Age International. pp. 11–13, 41–43. ISBN 978-81-224-1774-6. ^ S.R. Sharma (1999). Mughal Empire in India: A Systematic Study Including Source Material. 3. p. 765. ISBN 9788171568192. ^ S.R. Sharma (1999). Mughal Empire in India: A Systematic Study Including Source Material. 3. p. 767. ISBN 9788171568192.